There is no better way to spend a week of the summer than learning to be a rock star and being a part of a real band. From 9-3 Monday-Friday during the weeks of either July 8 or August 19, your child will learn from real musicians, what it is like to be in a rock band. From choosing a name to writing songs, they will be involved in the whole process. Their week will end with a big showcase for friends and family where they can celebrate their success along with all the other bands that are part of our camp. Backstage passes, a green room for the bands and cool rock star outfits will just be some of the other things they will enjoy as they learn more skills on their musical instruments and make new friends. Ages 6 and up welcome. Star in a musical this summer of scenes from your favorite shows. This one week intensive workshop will enable all kids to shine as they learn to sing, act and dance using scenes and songs from favorite shows. Vocal instruction, acting and dance instruction will all be provided as a part of this workshop. Their show will be performed at the end of the week complete with costumes for a large audience. Ages 6 and up are welcome. All ages are welcome into this program where kids, grades 3 and up will star in an amazing musical theater prodcution. (Title TBA) Rehearsals are in the evening and there will be 2 performances. This is a great opportunity for people who are in day camps but want to make musical theater a part of their summer. Roles are cast at the first rehearsals. Rehearsal schedules are distributed and we can work with summer conflicts like camps and vacations. For more information, call us at 914-762-8757. Check out our Musical Theater program here. 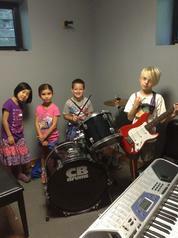 To register for Rock Band Camp or Musical Theater Camp, please fill out the form and fill out all the fields. You will be contacted to make payment arrangements and to get your signature on the registration info. Please specify the week if you are signing up for Rock Band Camp or Musical Theater Camp. Age and grade of participant? Will you be calling in a credit card or mailing a check? Please let us know if there is any special information you would like to share about your child? My digital signature confirms registration for my child for the summer program listed above. I acknowledge that payment must be received to confirm registration. If you want to perform for an audience like this one...join us for Rock Band Summer Workshop! You and your band will appear on stage and play songs that you helped write!